We pull together as more than workmates. Of course the Guild offers professional assistance and advocacy on issues of wages, hours and working conditions. 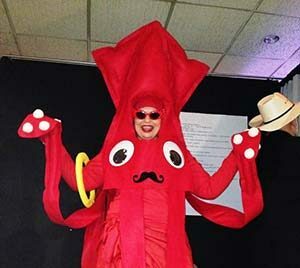 Guild members will do almost anything entertaining to raise funds for our scholarships. Members also support a scholarship fund to the tune of $10,000-$12,000 a year through an annual Follies held each February. This variety show is an opportunity to share a few laughs and put pride aside for an evening of entertainment featuring members and other celebs from Southern New England. Scholarships are drawn by lot in denominations of $500 and $1,000 on behalf of member-nominated family members or anyone else the member would like to sponsor. They help pay for post-secondary education in any field and are a welcome boost that some members have received more than once over the years. 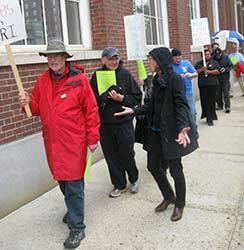 Journal retirees, from left, Brian Jones and Bob Chiappinelli, joining a picket line outside the Journal on Sept. 25, 2014, in support of a contract with GateHouse. Guild members also recognize that support for other working people’s issues is support for our own. Maintaining worth and dignity in work is, unfortunately, an ongoing challenge. Working conditions that erode around us eat away at our own foundation of strength. And reaching out to other unions in struggle is simply the right thing to do. So we’ll speak out, defend our fellow membersand join forces in support of working people and retirees on issues that can affect us all. • A $10,000 life insurance policy at no cost to members. A union workplace is a better paid workplace where employees can band together against individuals and policies that discriminate against individuals or attack employees as a group. Working together we build bonds that allow us to take more pride in our work, and that benefits all of us and the outlets we work for.